Happ went 3 of 4 with seven points over the opening 5:46. Only shot attempt the rest of the way came outside the paint. Let's make these next 20 minutes as fun as the first 20. Let's get back in this thing. Second half underway ... but what's the point without @phildawsonradio giving the crowd an over-the-top hype intro? There we go! More, please. Consecutive defensive stops for Wisconsin to begin the half, which include three airballs. Consecutive possessions for Wisconsin to hit 3-pointers. Badgers quickly cut the 9-point lead to three. Northwestern timeout. The #Badgers are within 31-28 after 3-pointers by Showalter and Brown off assists from Happ. So we got ourselves a ballgame. Holy Happ: #Badgers force two empty possessions and Happ assists on 3s to Showalter and Brown: 31-28 with 18:09 left. The #Badgers are back within three after back-to-back triples from Showalter and Brown. #Badgers defense has been stout on first three possessions. Bronson Koenig's first points come on a turnaround jumper from the free throw line. UW on an 8-0 run to start the half. 10-0 run by Wisconsin has put the Badgers in the lead at 32-31 at 15:55. Northwestern 0-for-8 to start the half. This half, we bounce back. 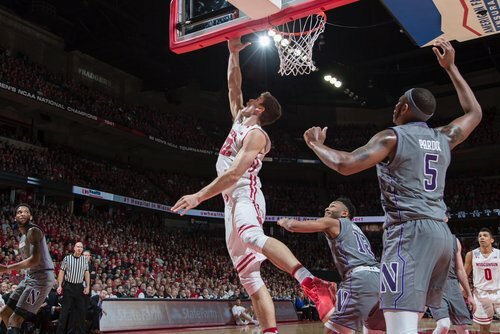 The #Badgers ' run is now 10-0 and they have a 32-31 lead, but Northwestern to the line when play resumes. Northwestern 0 of 8 to start the half. The #Badgers are 4 of 5, with Happ assisting on three of those baskets. Nifty little 10-0 run to open the second half. #Badgers open with 10-0 run over first 3:31 to take 32-31 lead. Cats 0-8 this half. UW 4-5 (2-3 from deep). #Badgers Happ has 3 assists on #Badgers ' 4 FGs. Wisconsin 4-for-5 from the floor so far in the second half. Ethan Happ leading the #Badgers with 7pts, 6reb, 5ast. Happ has 7 points, 6 rebounds and 5 assists. #Badgers have allowed 7 offensive rebounds. Pardon doing great job for Cats. Northwestern now on a 6-0 run and the Wildcats' lead is back up to seven at 39-32 with 13:14 remaining. Northwestern answers UW 10-0 run with an 8-0 run. Wildcats up 39-32, 13:14 left, and have 6 second-chance points this half. Northwestern responds with an 8-0 run and now the Wildcats lead by 7. Zak Showalter leads the #Badgers with 8pts. He's found the stroke again! THAT DERERK PARDON SLAM ???? Cats McIntosh went 10-19 for 28 points last season vs. #Badgers . He is 7-17 for 15 tonight. NU 43-37. Northwestern 5 of its last 7 from the field and leads 43-37 with 11:35 left. Vitto Brown leading Wisconsin with 9 points (3-4 3FG). #Badgers shooting 42.4% from the floor, 42.9% from deep. What did the rim ever do to @dererk5 do deserve this? What did the rim ever do to @dererk5 to deserve this? #Badgers in bonus for final 10:27. Happ makes a FT with 10:27 left in the 2nd half. First point since 14:14 remaining in 1st half. Ethan Happ now with more turnovers (four) than field goals (three). Northwestern smothering him w/ doubles around the basket.